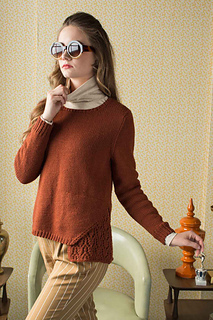 The Beatrice Sweater begins with the lace inset panel that is knit in when the body is joined in the round, adding asymmetry and interest to an otherwise conventional garment. Finished Size 34 (38.5, 42.25, 46, 50, 53.75)“ bust circumference. Pullover shown measures 38.5”; modeled with 3.5” of positive ease. 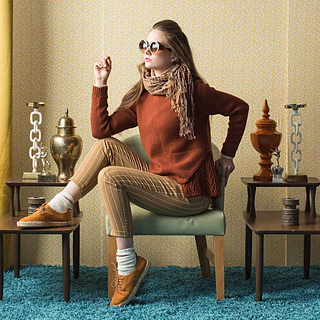 Yarn Valley Yarns Northampton (100% wool; 247 yd / 3.5 oz): #47 rust, 4 (5, 5, 6, 6, 7) balls. Yarn distributed by WEBS. Needles Size 7 (4.5 mm): 16” and 32” circular and set of double-pointed. Size 6 (4 mm): 16” circular and set of double-pointed. Adjust needle size if necessary to obtain the correct gauge. Gauge 17 sts and 24 rnds = 4” in St st on larger needle; 17 sts and 22 rows = 4” in lace patt on larger needle. Notes The lace inset panel is first worked and set aside. 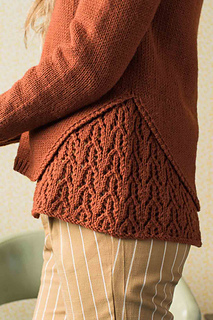 Then the body of the pullover is worked from the bottom up, flat at first to make a side vent and then the work is joined in the round, at the same time joining the lace panel with the body. 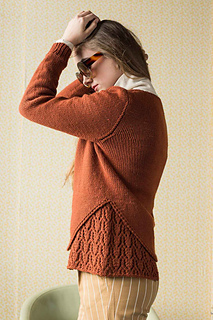 The pullover is worked in the round up to the underarms, then the front and back are worked separately back and forth. The sleeves are worked from the bottom up in the round, with the sleeve cap worked back and forth in rows.